Uncomfortable and uneasy—the root cause? There are things that make me uneasy about many of Fr. Seraphim (Rose)’s followers. I say many and not all because I have friends, and know a lovely parish, that is Orthodox today through Fr. Seraphim. One friend, who was going through seminary, talked about how annoyed he was, and appropriately enough, that Fr. Seraphim was always referred to as “that guy who taught the tollhouses.” (Tollhouses are the subject of a controversial teaching about demonic gateways one must pass to enter Heaven.) Some have suggested that he may not become a canonized saint because of his teachings there, but that is not the end of the world and apparently tollhouses were a fairly common feature of nineteenth century Russian piety. I personally do not believe in tollhouses, although it would not surprise me that much if I die and find myself suddenly and clearly convinced of their existence: I am mentioning my beliefs, as a member of the Russian Orthodox Church Outside of Russia, and it is not my point to convince others that they must not believe in tollhouses. It is with sympathy that I remember my friend talk about how his fellow seminarians took a jackhammer to him for his admiration of “that guy who taught the tollhouses.” He has a good heart. Furthermore, his parish, which came into Holy Orthodoxy because of Fr. Seraphim, is much more than alive. When I visited there, God visited me more powerfully than any parish I have only visited, and I would be delighted to see their leadership any time. Practically nothing in that parish’s indebtedness to Fr. Seraphim bothers me. Nor would I raise objections to the Russian Orthodox Church Outside of Russia’s newsletter affectionately calling Fr. Seraphim “our editor.” Nor am I bothered that a title of his has been floating around the nave at my present parish. Maybe you’re just not strong enough for true Orthodoxy. Maybe you would be happier at a spiritual salad bar like Wicca. But with all that said, there is something that disturbs me about most devotees of Fr. Seraphim, or at very least most of his vocal devotees. The best way I can put it has to do with subjectivism, which says in essence, “I will accept what I will accept, and I will reject what I will reject, and I will project what I will project.” There is something that demands that Fr. Seraphim be canonized as a saint regardless of whether he really should be, almost like “My country, right or wrong!” This isn’t the only thing that smells disturbing, but it is one. And these followers who insist that Fr. Seraphim be canonized as a saint seem to quickly gloss over how some of his group broke away from canonical status in the Orthodox Church to dodge Church discipline. Now I do not wish to exceed my authority and speakex cathedra to decisively say which sins should be a bar from sainthood; it is God’s job to make saints out of sinners, and any sin that Fr. Seraphim has committed, there are canonized saints who did something ten times worse. However, this is an example of something that needs to be brought to light if we are to know if Fr. Seraphim should be considered a saint, and in every conversation I’ve seen, the (vocal) devotees of Fr. Seraphim push to sweep such things under the rug and get on with his canonization. To pull something from putting subjectivism in a word: “I will accept what I will accept, and I will reject what I will reject, and I will project what I will project” usurps what God, Ο ΩΝ, supremely declares: “I AM WHO I AM.” Subjectivism overreaches and falls short in the same gesture; if you grasp it by the heart, it is the passion of pride, but if you grasp it by the head, it is called subjectivism, but either way it has the same stench. And it concerns me gravely that whenever I meet these other kinds of followers, Fr. Seraphim’s most vocal advocates, it smells the same, and it ain’t no rose. A second concern is that, in many of Fr. Seraphim’s followers, there is something Protestant to be found in the Church. Two concerns to be mentioned are “Creation Science”-style creationism, and the fundamentally Western project of worldview construction. On the issue of “Creation Science”-style creationism, I would like to make a couple of comments. First, the Fathers usually believed that the days in Genesis 1 were literal days and not something more elastic. I believe I’ve read at least one exception, but St. Basil, for instance, insists both that one day was one day, and that we should believe that matter is composed of earth, air, fire, water, and ether. The choice of a young earth and not any other point of the Fathers is not the fruit of the Fathers at all; it is something Protestant brought into the Orthodox Church, and at every point I’ve seen it, Orthodox who defend a young earth also use Protestant Creation Science, which is entirely without precedent in the Fathers. One priest said, “It was easier to get the children of Israel out of Egypt than it is to get Egypt out of the children of Israel.” There have been many Orthodox who believe entirely legitimately in a young earth, but every single time I have met young earth arguments from a follower of Fr. Seraphim, they have drawn on recycled Protestant arguments and fundamentalist Protestant Creation Science. And they have left me wishing that now that God has taken them out of Egypt they would let God take Protestant Egypt out of them. I observed something quite similar to this in a discussion where I asked a partisan of Fr. Seraphim for an example of his good teaching. The answer I was given was a call for Orthodox to work on constructing a worldview, and this was presented to me as the work of a saint at the height of his powers. But there’s a problem. The project of worldview construction, and making standalone adjustments to the ideas in one’s worldview, is of Western origin. There is no precedent for it in the Fathers, nor in medieval Western scholastic theologians like Thomas Aquinas, nor for that matter in the Reformers. The widespread idea that Christians should “think worldviewishly”, and widespread understanding of Christianity as a worldview, is of more recent vintage than the Roman proclamations about the Immaculate Conception and the Infallibility of the Pope, and the Protestant cottage industry of worldview construction is less Orthodox than creating a systematic theology. If there is an Orthodox worldview, it does not come from tinkering with ideas in your head to construct a worldview; it arises from walking the Orthodox Way for a lifetime. Protestants who come into Orthodoxy initially want to learn a lot, but after time spend less time with books because Orthodoxy has taken deeper root in their hearts and reading about the truth begins to give way to living it out. Devotional reading might never stop being a spiritual discipline, but it is no longer placed in the driver’s seat, nor should it be. This tree: What to make of its fruit? Beware of false prophets, who come to you in sheep’s clothing but inwardly are ravenous wolves. You will know them by their fruits. Are grapes gathered from thorns, or figs from thistles? So, every sound tree bears good fruit, but the bad tree bears evil fruit. A sound tree cannot bear evil fruit, nor can a bad tree bear good fruit. Every tree that does not bear good fruit is cut down and thrown into the fire. Thus you will know them by their fruits. Fr. Seraphim has borne fruit in his lifetime and after his death. In his lifetime, there was the one fruit I mentioned, a close tie to someone who broke communion with the Orthodox Church shortly after his death. After his death, he has brought Protestants into the Orthodox Church. But in the living form of his disciples, those who have been taken out of Egypt seem not to have Egypt taken out of them; they have asked me to pay homage to Protestant calves they’ve brought with them. Let me try to both introduce something new, and tie threads together here. Subjectivism can at its heart be described as breaking communion with reality. This is like breaking communion with the Orthodox Church, but in a way it is more deeply warped. It is breaking communion not only with God, but with the very cars, rocks and trees. I know this passion and it is the passion that has let me live in first world luxury and wish I lived in a castle. It tries to escape the gift God has given. And that passion in another form can say, “If God offers me Heaven, and Heaven requires me to open up and stop grasping Fr. Seraphim right or wrong, I will escape to a Hell that makes no such demand for me to open up to God or His reality.” And it is a red flag of this passion that breaks communion with reality, that the people most devoted to Fr. 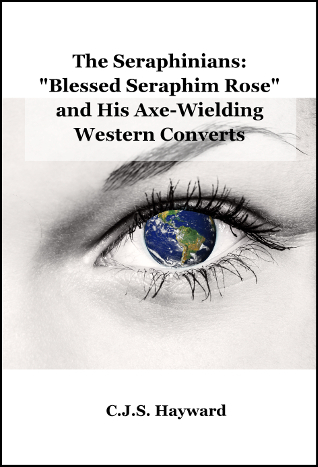 Seraphim hold on to pieces of fundamentalism with a tightly closed fist. And these Protestant insistences are a red flag, like a plume of smoke: if one sees a plume of smoke coming from a house, a neighbor’s uncomfortable concern is not that a plume of smoke is intolerable, but that where there’s smoke, there’s fire and something destructive may be going on in that house. And when I see subjectivism sweep things under the rug to insist on Fr. Seraphim’s canonization, and fail to open a fist closed on Protestant approaches to Holy Orthodoxy, I am concerned not only that Fr. Seraphim’s colleague may have broken communion with the Orthodox Church to avoid Church discipline, but that Fr. Seraphim’s devotees keep on breaking communion with reality when there is no question of discipline. The plume of smoke is not intolerable in itself, but it may betray fire. I may be making myself unpopular here, but I’m bothered by Fr. Seraphim’s fruit. I know that there have been debates down the centuries between pious followers of different saints—but I have never seen this kind of phenomenon with another well-known figure in today’s Orthodoxy. So far as I have tasted it, Fr. Seraphim’s fruit tastes bad.